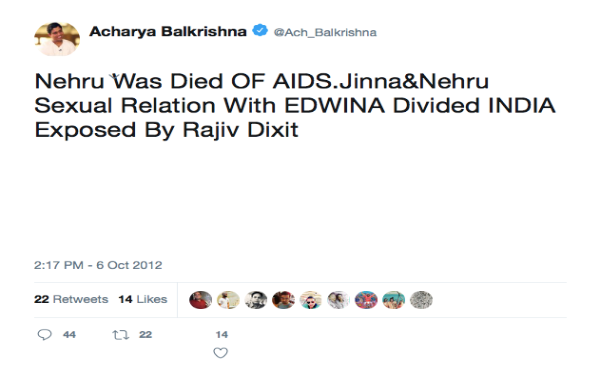 Acharya Balkrishna, managing director and founder of Patanjali Ayurved has deleted a 6-year old tweet where he claimed the country’s first Prime Minister Jawaharlal Nehru died of Syphilis. Balkrishna had in 2012 tweeted a viral Youtube video made by Baba Ramdev’s aide Rajiv Dixit. This tweet by Balkrishna made a comeback on Wednesday – Nehru’s birthday. Rajiv Dixit passed away in 2010 under mysterious circumstances. 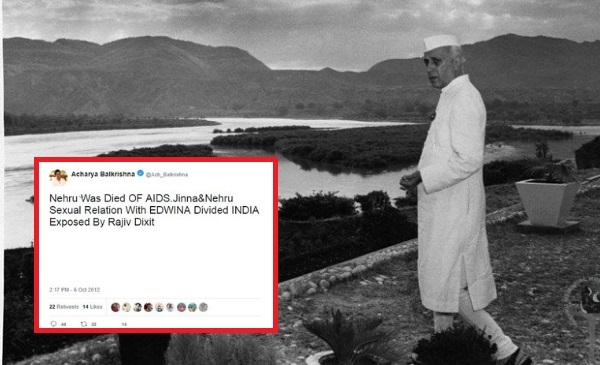 The tweet which has now been deleted, following BOOM’s query to the company, said, “Nehru Was Died OF AIDS.Jinna&Nehru Sexual Relation With EDWINA Divided INDIA Exposed By Rajiv Dixit” and was accompanied with Dixit’s video. (View archived version of the tweet here). Balkrishna tweeted the video on October 6, 2012 a day after Dixit uploaded the video on Youtube. (BOOM is not embedding the video in the story) The Patanjali MD’ tweet started gaining traction on Nehru’s birthday and was retweeted 22 times, before it was deleted. Dixit’s video on YouTube has more than 5 million views. 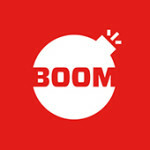 BOOM reached out to SK Tijarawala, spokespeson, Patanjali Ayurved who confirmed that they had deleted the tweet after we sought a clarification from the company on the 6-year old tweet. Tijarawala said that the tweet had been put out by an employee who was part of the social media team of Balkrishna. He also claimed that Patanjali had fired the person who put out the tweet in 2012 itself. It is however unclear why the company or Balkrishna never chose not to delete the tweet till it was brought to their notice by BOOM. India’s first Prime Minister Nehru and his death in 1964 has been the topic of scurrilous online conversations over the last few years. 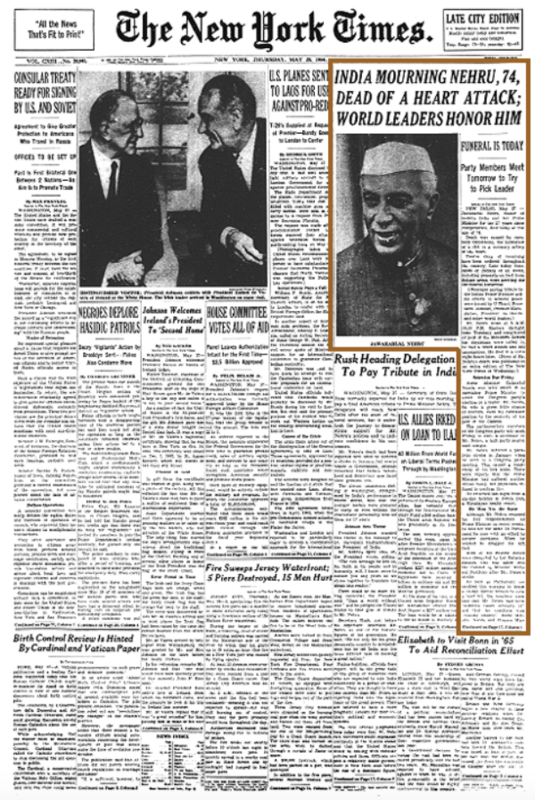 The claims regarding Nehru’s death range from Syphilis to Acquired Immuno Deficiency Syndrome (AIDS). Delhi based advocate Prashant Patel Umrao, who has been caught several times tweeting fake news, had tweeted in 2015, “Be safe Tehseen & leave bad habits. Nehru also died due to Syphilis.” He was replying to Congress supporter Tehseen Poonawala’s tweet about actor Charlie Sheen being diagnosed as HIV positive. Troll Twitter account Squint Neon in March this year claimed the same and said, “Nehru brought STD and without STD we would not be able to call anyone. #ThanksToNehru”. 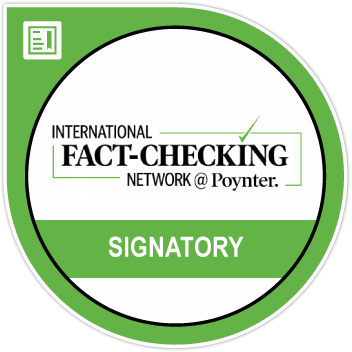 @legolasthehansy : What is wrong is Nehru’s death certificate is notified as official secret. Why? 👉 Nehru died from Sexual disease Syphilis. made the people produce kids like Pigs to create vote banks.